Wherever targeted warmth is required immediately without a long warm-up time, the quartz radiator IR 1200 S is the optimal solution. Applied on the balcony, roofed over terrace or in the in the catering area: the practical all-rounder generates direct heat by means of infrared radiation following the natural principle of the sun and thus cosily warms up the immediate surroundings from the very first moment. The radiant heater operates entirely odourless and noiseless and, since it does not have a fan, it does not raise any dust either. This is particularly advantageous for allergy sufferers. Coming equipped with two modern quartz heating rods, the infrared radiant heater converts a major part of the energy input into direct heat, which makes it particularly energy-efficient. The IR 1200 S comes with two heating levels of 600 and 1200 watts of heating capacity. Even the lowest level delivers impressive heating results. The radiator can be conveniently operated with the integrated pull switch. To ensure a precise alignment of the thermal radiation the infrared radiant heater intended for wall mounting can be adjusted by 60°. The high-quality metal housing – splash-proof according to protection type IP24 – makes the quartz radiator IR 1200 S an appealing heat source. Owing to the integrated suspension device it is assembled with lightning speed. Then all you need to do is plug the device in, pull the pull switch and indulge in the directly radiated cosy warmth! The infrared radiant heater IR 1200 S is supplied in Intertek-tested quality, thus guaranteeing high value, safety and functionality and making sure that you are always on the safe side with Trotec brand quality. 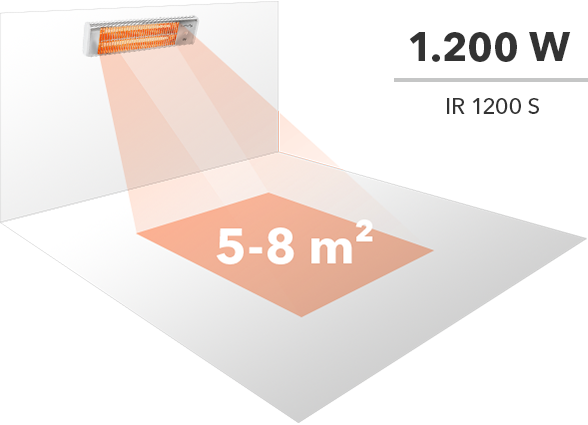 With a width of 538 mm and up to 1,200 watts of power the IR 1200 S can provide infrared heat for many possible applications. The rip cord can be used to single-handedly switch the infrared radiant heater on or off without much effort. You can change the heating levels in the same manner. Two heating levels provide quick and noiseless heating without raising dust. The steplessly adjustable radiator head can be tilted to an inclination angle of 60°. Guests in the catering and hotel industry can be entertained on the terrace all year round even on rather chilly days. Brings comfort and warmth to conservatories, roofed over balconies or terraces. Can also be used as a small equine solarium. Heat source for cool summer nights under parasols or awnings. 39.95 € 19.94 € inkl. MwSt. 33.57 € 16.76 € zzgl. MwSt. 74.95 € 34.95 € inkl. MwSt. 62.98 € 29.37 € zzgl. MwSt. Der Infrarotheizstrahler IR 2500 S verfügt dank seiner Länge von 870 mm über ein großes Wirkungsfeld und durch die Heizleistung von 2.500 Watt eine weite Erwärmungsfläche. Das Gerät ist dank des um 90° verstellbaren Neigungswinkels präzise ausrichtbar. 119.94 € 54.95 € inkl. MwSt. 100.79 € 46.18 € zzgl. MwSt. Mit 2.500 Watt sorgt der IR 2550 S für wohltuende Wärme. Das Gerät ist dank des um 90° verstellbaren Neigungswinkels präzise ausrichtbar. Mit der IR-Fernbedienung lässt sich der Strahler ein- und ausschalten, die Heizstufen auswählen sowie der 24-Stunden-Timer steuern. 129.95 € 59.95 € inkl. MwSt. 109.20 € 50.38 € zzgl. MwSt. 169.94 € 74.95 € inkl. MwSt. 142.81 € 62.98 € zzgl. MwSt.